There are 4 Metro lines in Amsterdam, but tourists should really never need more than two of them. One will take you to Amsterdam RAI for conventions, the other will take you to Amsterdam Arena for football, soccer, and large events. Lijn 50 – Line 50 on the Amsterdam Metro runs on the outskirts of the city and connects the major event centers RAI & Amsterdam Arena. 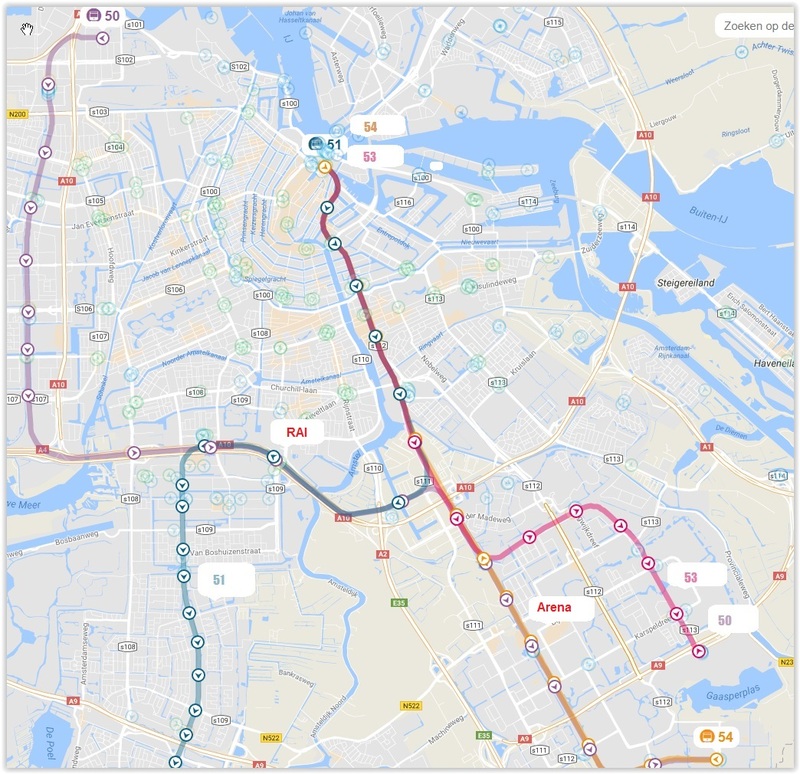 Major Stops – Amsterdam Zuid, RAI, Amsterdam Arena. Transfers – To get to Centraal from Line 50 transfer at OVERAMSTEL (51 or 54), RAI(51 or 54), or AMSTERDAM ARENA (54). Lijn 51 – Line 51 on the Amsterdam Metro will get you to Amsterdam RAI convention center. Major Stops – Amsterdam Centraal, Waterlooplein, Weesperplein, Spaklerweg, Amstelstation. Lijn 53 – For most tourists Line 53 is only good for short travels within the canal rings and Centraal Station. Lijn 54 – Line 54 on the Amsterdam Metro is the way to Amsterdam Arena. Major Stops – Amsterdam Centraal, Waterlooplein, Weesperplein, Spaklerweg, Amsterdam Arena.